On May 1, 2015, HPCAV was presented the 2014 FBI Director’s Community Leadership Award at FBI Headquarters, Washington, DC by Director James B. Comey. HPCAV was selected as the organization in North Carolina to receive this recognition. Board President Gretta Bush, Board members Robert Martin and Chris Martin, Executive Director Jim Summey, and High Point Police Chief Marty Sumner were there to receive the award. This special award was created in 1990 as a way to honor individuals and organizations for their efforts in combating crime and violence in America. Nominations are submitted by area FBI Field Offices. High Point Community Against Violence was formed in 1997. 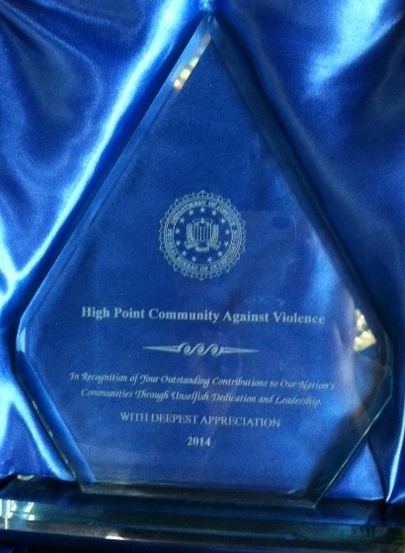 HPCAV was honored to receive the FBI Director’s Community Leadership Award for 2014 at a presentation on November 20, 2014. Deron W. Roberts, FBI Special Agent in Charge from the Charlotte, NC office made the presentation to Jim Summey, HPCAV Executive Director and Gretta Bush, HPCAV Board president. HPCAV was selected from nominations throughout NC. Members of the organization will travel to Washington, DC in May, 2015 for the official presentation ceremony, joining winning community organizations from other states. HPCAV members with FBI Agent Roberts.